Simplilearn is a leading provider of a suite of professional certification courses that address unique learning needs of working professionals. 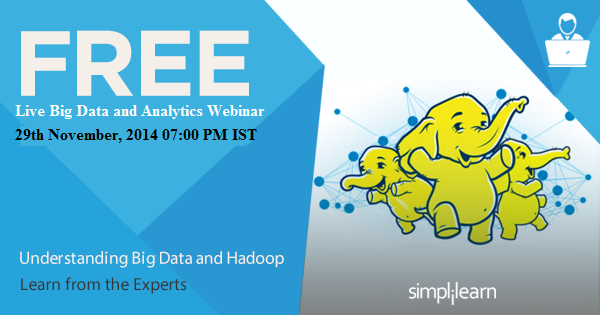 Here’s a learning session that you always wanted to attend – A Webinar on Big Data and Analytics. This session will cover topics from Business Analytics Foundation – SAS & R along with Big Data and Hadoop concepts. By the end of the webinar, you would be having a good grasp on the concept of Big Data, Hadoop Components and better insights on how analytics support Big Data. For all the business analysts and Big Data practitioner, here's a valuable opportunity to interact with an expert and understand Big Data & Analytics with relevant examples.